A clear leader in the longest tyre name category, the Maxxis Ardent Race has become the tread to reach for when you want a little more grip than your standard XC race tyre might offer. 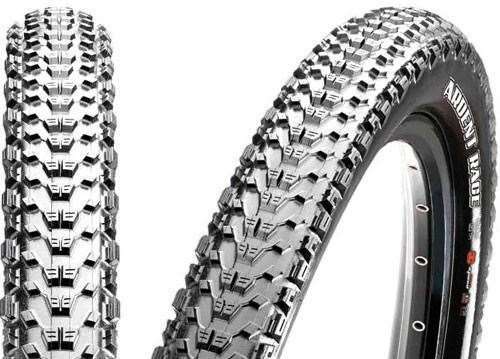 A clear leader in the longest tyre name category, the Maxxis Ardent Race has become the tread to reach for when you want a little more grip than your standard XC race tyre might offer. I’m a big fan of the Maxxis range, and have typically run the Maxxis Ikon 3C EXO on my own bikes. But the trusty Ikon does have a fairly narrow performance window, not really enjoying mud or particularly loose or wet surfaces. The Ardent Race is essentially the offspring of the Ardent and the Ikon. It marries some of the fast rolling ability of the Ikon, with the edge grip of the Ardent, and some of the transition knobs of the Ikon too. Fitting the Ardent Race to the same bike was a revelation. The Ardent Race does look a little bigger than the Ikon, primarily with extra side knob – even though they aren’t that tall. The 3C refers to the triple rubber compound, where a firmer compound is on the top of the tyre for faster rolling and good wear, while a softer compound is used on the shoulders for more grip. The EXO casing is hard not to like. It’s 120tpi, and highly puncture resistant. This model is ‘TR’ which is tubeless ready. They inflated easily on ZTR Crests, ZTR Valor, and Kappius KR 29 rims. All of those were just with a big standard track pump. The tyre is very confident as a trail tyre on looser terrain, and for loose over hardpack. The softer shoulders and tread worked very well on wet roots as well – again, in comparison to an Ikon. The biggest difference I have noticed though is confidence at speed. I’m just more sure that it will hold a line and even float over big rocks better than an Ikon. It’s not light at 720g, but I’ve come to feel the penalty is worth it for the time gained in confidence in terrain that is looser or faster. You could save 50g by not having the EXO casing, but to me this is such a brilliant casing for flat protection that it’s not worth considering. As I’m currently on a long trip with about 10 marathon racing days in it, and plenty of big days in high mountains, I’ve kept the Ardent Race up the front, but switched out to the Ikon on the back again. I think this is a great combination for long rides, but the Ardent Race makes for a great front and rear trail combination too.